Enjoy all of your music, games and movies from your Android phone, iPhone, iPad or any Bluetooth enabled computer through our high quality Class D wireless Bluetooth integrated amplifier. Just plug this compact Bluetooth receiver with integrated amplifier into any standard speakers and pair your Bluetooth device. It's that easy to turn your Bluetooth enabled Smartphone into a wireless sound system for your office, den, kitchen or any room inside or outside your home. Stream music up to 36 feet (actual distance varies with use, settings and environmental conditions). Enhanced noise filtering to minimize noise imparted by any Bluetooth device! Stream music via any Bluetooth enabled device such as a smartphone, tablet, PC, or MAC to our high performance integrated amplifier with built-in Bluetooth 4.0 or play music from an additional audio source via the aux-in jack. True 50 watt class D digital amplifier powers any standard bookshelf or floor standing speakers. The Compact size is perfect for your bookshelf, den, or computer desktop stereo system. Stream Pandora, SiriusXM, Internet radio or your iTunes music directly from your smartphone or Bluetooth enabled lap top or desktop computer. 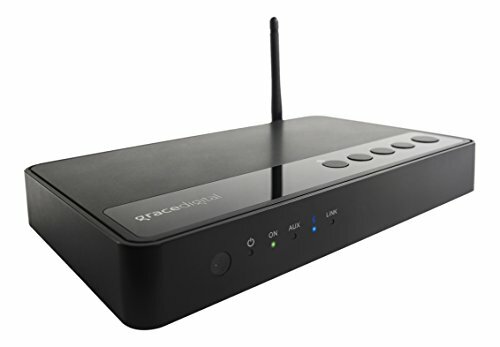 If you have any questions about this product by Grace Digital, contact us by completing and submitting the form below. If you are looking for a specif part number, please include it with your message.